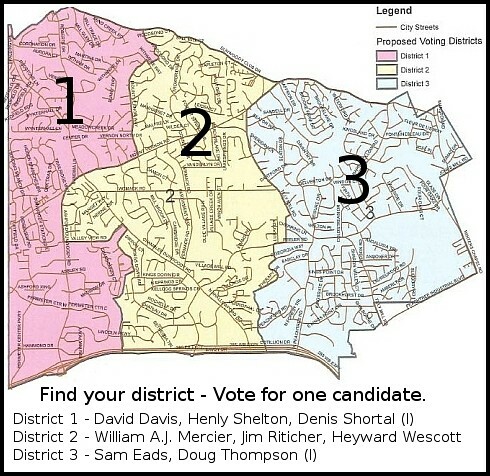 Dunwoody Election Day on November 5th - you only get to Vote for One candidate. Who will it be? Various candidate forums will be forthcoming in the coming month to attempt to differentiate the views of the candidates so that you can cast an educated ballot on Tuesday November 5th. The big thing to remember is that come election day there will only be one choice to make and it will be determined by where you live. This election is for the local district city council seats whereby you get to vote for only the candidate who lives in your district and the winning candidate will only be elected by the people of that same district where he lives. 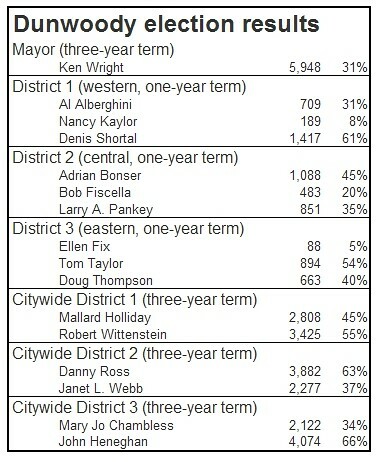 The other two races, though very important - will not be decided by the people who live outside that district. This race is as local as you can get and the key to winning is turnout, especially where there are three candidates in the race. A known election tactic is to have a group actually run two candidates where there is a third "possibly stronger" candidate so that the vote is split three ways forcing a runoff between the two who received the highest number of votes. This tacit is counting on a very low run off election whereby it is almost perceived to be just a vote between the friends and family of the two candidates and little more. There was a minor redistricting in 2010 because of the census but here are the 2008 election results which had all three of the local races participating. You can see minor differences in the voting totals between districts 1, 2 & 3 even though the population was pretty equal and those turnout numbers will be very important to the candidates running. I am guessing there are a lot of neighborhood walking tours going on whereby the candidates have lists on which houses vote on a regular basis and even which way they lean. If you are a regular voter, I am guessing your doorbell will be a ringing. In past elections I have offered to post candidate election announcements and will happily do so again for this election if contacted directly by the candidate and provided positive information to post. I have already done this for Councilman Doug Thompson & Mayor Pro Tem Denny Shortal when they announced their reelection bid. As the two incumbents running for reelection they have been regular fixtures on this blog and should be well known by many in the community. I also posted an announcement for District two candidate, Hayward Wescott when he announced but haven't been contacted by, nor know, the other candidates. None the less, the offer to post stands. I conducted a very basic internet search on each of the candidates and linked the candidates names below with what seems to be their main campaign website. Nothing was found for David Davis in District 1 nor for William A.J. Mercier in District 2, but I will happily post when available. I then searched for each of the candidates filings with the State Ethics Commission and posted the link on the home address to the page where each candidates campaign contributions will be listed (due by October 7th). Finally I searched for the candidates personal financial disclosures by city and then by name as one candidate is using a PO Box out of Atlanta. The documents are now due to be filed and some seem to be missing from the website, some were filed electronically and are viewable on line and others were filed in person or via a paper version which makes it more difficult to view but the records are available by a simple request. Please determine what district you live in so that you can hone your candidate research down to the contest that matters to you. Help us plant tress at Brook Run !!! Volunteers have the opportunity to join in the activities with two separate start times and locations. Join us for Dunwoody’s annual Clean, Fix, & Shine-Up Dunwoody day at Brook Run Park. In partnership with Trees Atlanta, we’ll be planting 300 trees in the park as well as taking care of some general park maintenance. 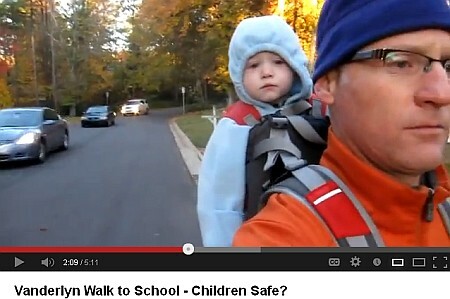 Please meet us at 9 a.m. in front of the children’s playground area. If you have extra gloves or tools such as rakes, clippers or shovels, these are appreciated. We recommend bringing your own water and snacks (if needed). A little action goes a long way; come be part of it! Anyone interested in volunteering can register at www.nacofc.org/#/serve-day or email Julie.Stanley@nacofc.org or call 770-399-5222. Volunteers can also contact Brent Walker, Dunwoody Parks and Recreation Manager, at 678-382-6700. Video - everything except three deferred items approved. Appointment of the Internal Auditor. Approval of Agreement with ConnectSouth for Georgia. Approval of Audit Committee Appointment Nominations. Approval of Request from Dunwoody Homeowners Association for Continuation of City Co-Sponsorship for Food Truck Thursdays. Resolution for the Purchase of the Final Tract ("C") of the 19 Acre Property. Award of 2013 Neighborhood Paving Contract. Award of Contract for the Roof Replacement at the North DeKalb Cultural Arts Center. SECOND READ: Ordinance to Approve the Lease of the Property Located at 4555 North Shallowford Road. Deferred Discussion of Marta Bus Shelter Agreement. Attorney / Client privileged memo presented by City Atty to Council and second legal review specializing in subject is currently reviewing for possible next steps. Deferred Appointing Members to Serve on Dunwoody Alcohol License Review Board. Resolution Appointing Members to Serve on Convention & Visitors Bureau of Dunwoody. Deferred Appointing Members to Serve on Dunwoody Construction Board of Appeals. Certificate of Appreciation from Georgia Association of Chiefs of Police to State Representative Tom Taylor. Proclamation - "Red Ribbon Week". Approval of the Minutes of the September 17, 2013 City Council Special Called Meeting. Discussion of Marta Bus Shelter Agreement. Resolution Appointing Members to Serve on Dunwoody Alcohol License Review Board. 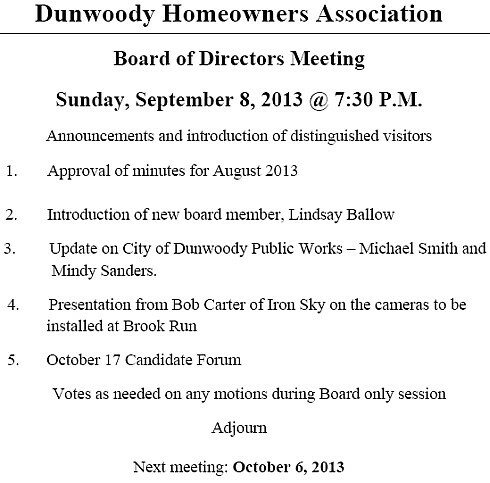 Resolution Appointing Members to Serve on Dunwoody Construction Board of Appeals. 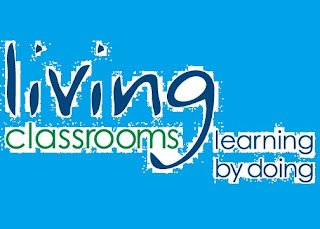 Peachtree Charter Middle School's LIving Classroom is looking for volunteer gardeners on Saturday at 1 pm - bring plants if available. "Bush Bonanza" and Landscape Design Challenge! All students, families, and community members welcome. Bring shovels, wheelbarrows and gloves. other hardy sun loving bushes from your yard or local nursery. Vines such as star jasmine, trumpet flower, etc. also accepted! These will be planted on the outside of the fence line. Remember, they need to survive full sun! Donate a bag of planting soil to help! Help us transform the fence line into a work of art in just 4 hours! We will plant as many bushes as we can get around the outside border of the garden. Great schools are cultivated...we need your help. Explore Dunwoody. Discovering new places to shop and dine while enjoying live entertainment and music! Restaurants and retailers will be offering special promotions and extended hours just for you. 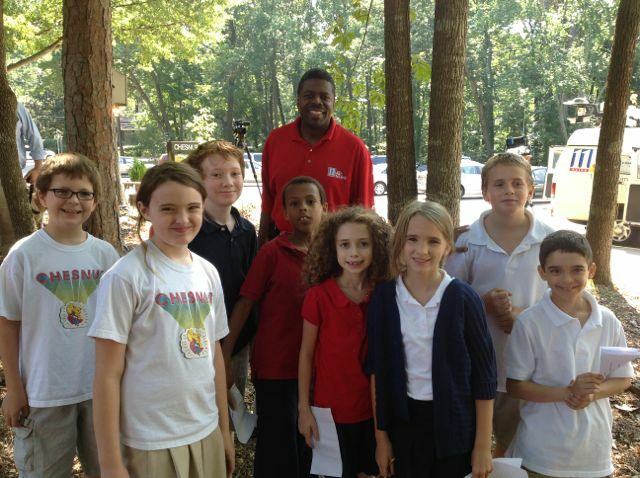 11 Alive Meteorologist Chesley McNeil visited Chesnut Charter Elementary this morning. After answering questions from the students, Chesley did his broadcast for 11 Alive at Noon outside the school flanked by many 3rd graders from the school and 4th and 5th graders representing Chesnut's First Lego League robotics team. The visit was set up by 3rd grade teacher and FLL sponsor Stacia Brown to help the FLL team--whose problem area they will be working with this year involves weather--and 3rd graders have a hands-on learning experience with meteorology. I was scrolling through photo archives and figured that many in the community have no history of the huge hospital at the back of what is now Brook Run Park. 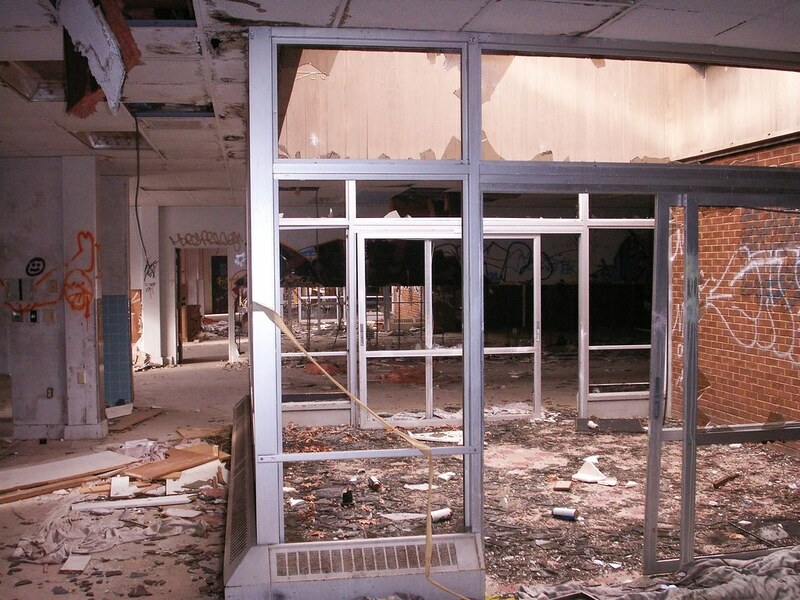 As someone who walked though every building and took the following photos in 2007, I figured I would share. 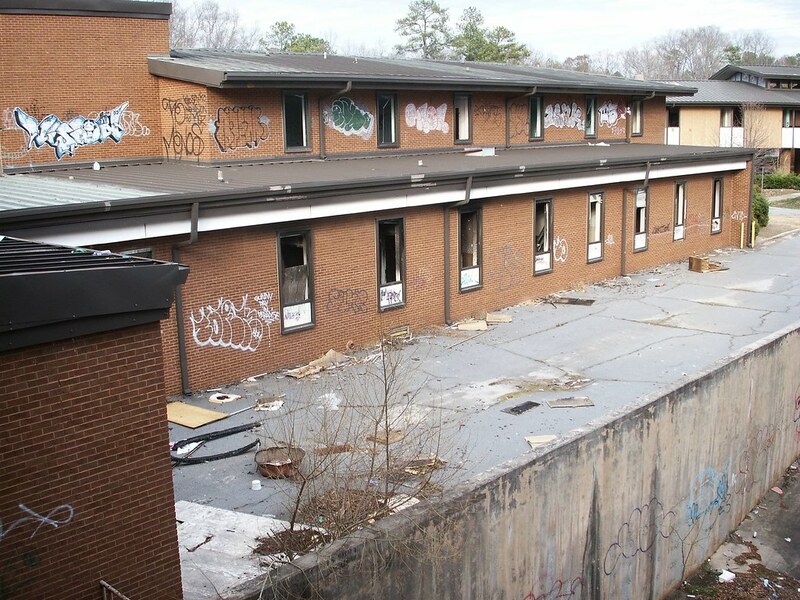 As happy as I am that the old buildings are down, I will be much happier once the lawsuit against DeKalb County is settled whereby I believe they still owe us close to $7 million for the development of Brook Run Park. 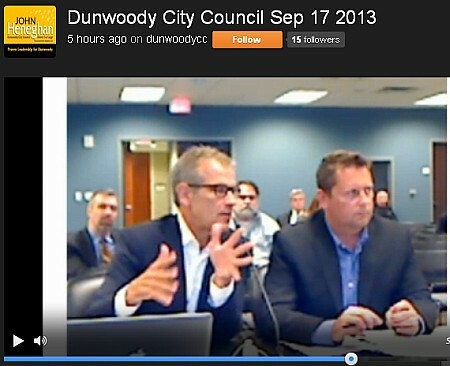 Video and recap from the special Dunwoody rezoning meeting. Planned Mixed Use Developments with a residential component are currently allowed (with concurrent variances) where there is a plot of land that is 10 or more acres in the Dunwoody Village & Georgetown character areas. We had a discussion of expanding these developments city wide; therefore I proposed a larger site of 20 acre be needed but Council backed that down to a 15 acre min. At some point I look for a Perimeter Zoning District to be formed and I would still be fighting for larger areas while others may want smaller limits to create such zoning classifications. Stream Buffers - Council liked the recommended 75 ft undisturbed area but Councilman Thompson successful argued that items in that last 25 feet should be able to be reconstructed as original without going to ZBA. Discussed for special exemption on adding vegetation in the last 25 feet as these improvements would slow water flow and add filtration long term. The home occupation item had little movement, we sped up the overall Special Land Use Permit process for all applicants and then kept the status quo requiring all Home Based Businesses with customer contact to apply for the SLUP which then has to be approved by the City Council. We did grant educational home businesses operating inside the home to apply for a business without a SLUP thereby granting tutors and music teachers a fast track not available to others. Household pets were proposed to be limited to not over 3 and Council rejected the thought that any number over 3, would be a nuisance. Some on Council wanted to define what "Nuisance" was and let Code Enforcement go from there and others wanted to assist Code Enforcement by adding a hard number but then what number should it be? I was thinking 10 animals but Council decided to put this entire item out of the Code for now. We discussed community gardens being allowed on church property, rooming house's, the definition of what is a "Household", Apartment reconstruction being allowed as is if the building is destroyed by act of God or arson and many other things. Look for this to come back to Council on October 14th. Dunwoody Council to discuss Building Lease, Planned Developments, Home Occupations, Companion Animals, Rooming Houses, Stream Buffers and much, much more. It will be a long night for the Dunwoody City Council starting at 6 pm, as we discuss the many proposed changes to the zoning and land development codes. Get ready to hear, “What problem are we solving?” over and over as we weigh the proposed changes. Zoning Rewrite Hype-Free Zone: What does it really say? Many of the aforementioned topics required additional research and input from Staff –the results of which are manifested in text amendments below and attached white papers. Additional discussion may be needed to decide if the amendments are sufficient for clarifying information. Council requested Staff revise the location of the “definitions sections” so they are consistent between the chapters. This change will be completed when the transmitted draft is cleaned and distributed in the packet for the second read. Lastly, after the special called meeting in August, Staff was contacted by the Atlanta Apartment Association with concerns of the proposed nonconforming language as they relate to multi-family uses and structures; the memo from the Association is attached. 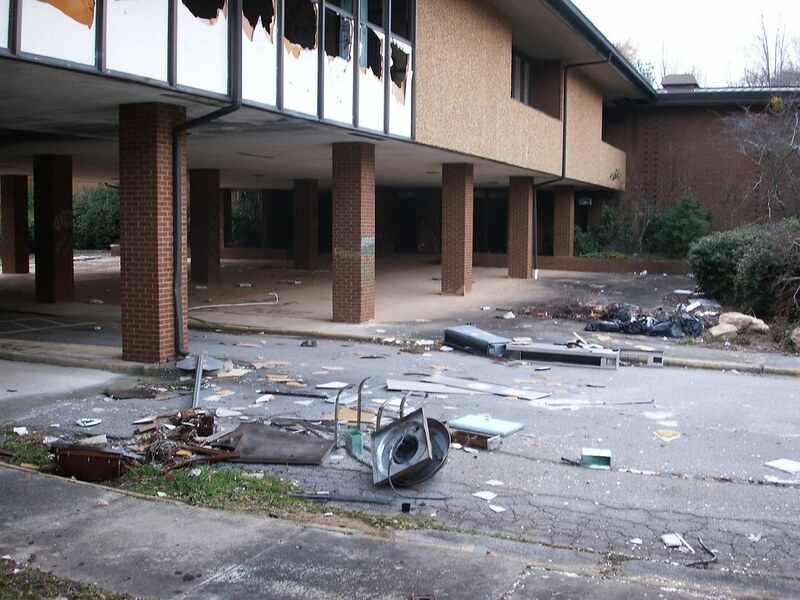 The primary issue the Atlanta Apartment Association had was losing the ability to rebuild if various willful damages occurred outside of their control. As a result, Staff is currently working with the Association on language that forwards the intent of the proposed regulations while addressing their concerns. Lease of 4555 N Shallowford (at Pernoshal Court) by Emory to operate an out-patient surgery center. I was sent the following document by someone at MARTA, so someone wants it spread far and wide and I am happy to oblige. The annual financial report of MARTA is required to be sent to the Metropolitan Atlanta Rapid Transit Overview Committee of the State Legislature, chaired by Rep Mike Jacobs. MARTA’s GM/CEO, Mr. Keith Parker is receiving high marks from both the media and I believe the State Legislature for recent changes and as a daily rider for over 15 years on the MARTA the system, I readily admit that it serves me quite well. I like the latest Ride with Respect push but remember that respect is a two way street and that it needs to be earned by the system everyday with quality consistent service and that would include new amenities that may expected by business travelers. Mr. Keith Parker, for system safety & security as well as to draw business travelers back into the transit fold; I recommend that you work to obtain phone & internet services underground and in the tunnels. Washington D.C. has had this availability for years and Chicago has just gone out to bid; so please keep MARTA moving forward. Thanks & please keep up the good work Mr. Parker. Full City Agenda docs here. Nearly all of the city’s existing regulations are based on county ordinances in effect before the city was incorporated. It is time for the city to chart its own course with respect to the rules that govern land use, development and redevelopment. These regulations must also respect the established character of the city’s many high-quality neighborhood areas. Since formation of the city in 2008, several major, citizen-driven planning initiatives have been completed. The city’s new comprehensive plan as well as the master plans for Dunwoody Village and the Georgetown-Shallowford Road area establish key goals and policies that can and should be implemented through new and revised regulations and design guidelines. The city has engaged a consultant team to lead the project. They have been examining the city’s existing regulations as well as various planning documents that provide the all-important policy framework for new Dunwoody-style ordinances. On January 24, the consultants conducted several small group listening sessions with city council members and representatives of several local boards and commissions. That evening, a public kick-off meeting was held at Dunwoody Baptist Church, where the consultant team gave an overview of the project and engaged the audience in an issue-identification exercise. Do you want to help with the Dunwoody Guns & Hoses Charity Event? 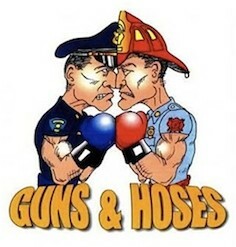 Coach Gilly (former DHS Baseball Coach) is spearheading the 2nd Annual Guns & Hoses Event. 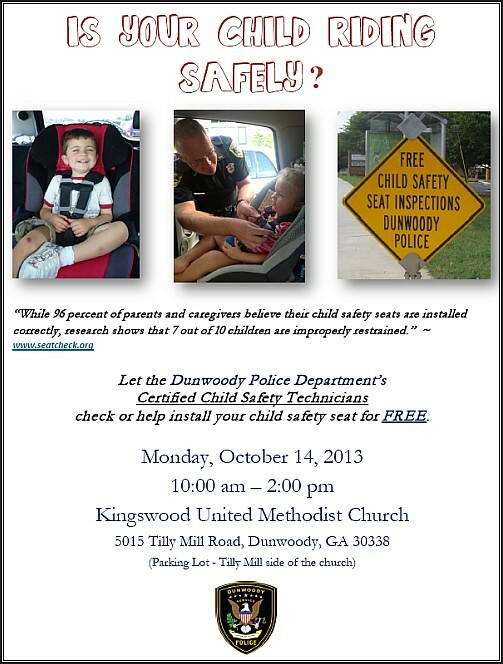 The Dunwoody Police Dept. is having this Fundraiser Softball Game for children’s charities on Saturday, Oct. 5 beginning at 9am at Dunwoody Senior Park (4 teams – 2 Police and 2 Fire). Think of who you would call first if you needed help…so please give a couple of hours to support them. 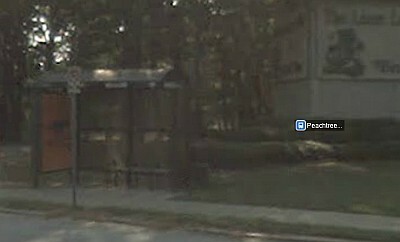 Illegal commercial bus shelters need to be removed in Dunwoody !!! Visual pollution needs to go. 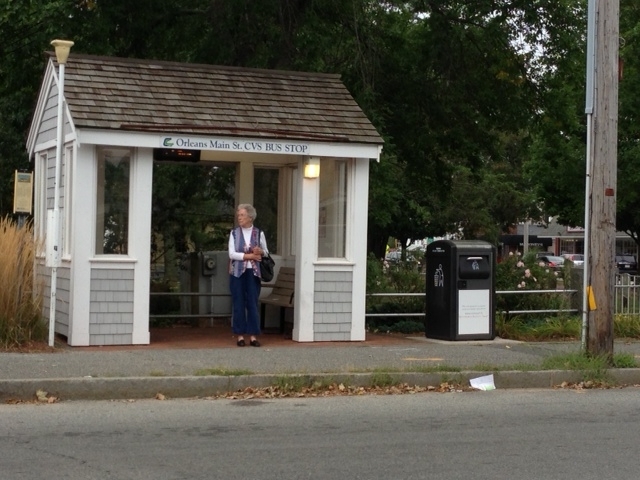 The illuminated bus shelter above was installed in April 2012 after our sign ordinance was put into place in July 2011, whereby it replaced a plain green shelter that had no illumination and drab advertising. It appears that no sign nor electrical permits were pulled to change the bus structure and the City of Dunwoody has no contract in place saying that we allow these fixtures in our city. It is my opinion that once these 12 commercial structures were upgraded throughout the city without our approval that they are now in blatant violation of city codes; therefore should all be removed as allowed by our sign ordinance. At our June 10th City Council meeting the City presented us with the revenue sharing agreement / contract that I successfully argued that we should not be signing for numerous reasons. 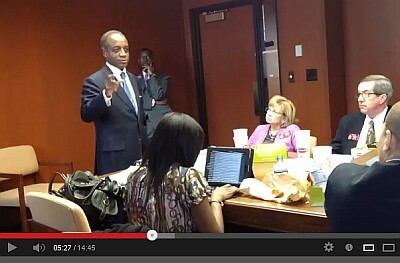 Watch the video of meeting starting 53:30 to 1:19:00 on my site or view the city video and there is also a recap of the meeting from Dunwoody Talk if you want to read about his impressions from watching the meeting. After being told by legal staff that we had to sign the contract for various reasons, I disagreed and argued that we should not sign the document as we had valid grounds for removal of the signs. I informed the Council that I notified the City of the illegal structure installations in our right of way in April of 2012 and that it was my opinion that these signs should now be removed as allowed in our code. 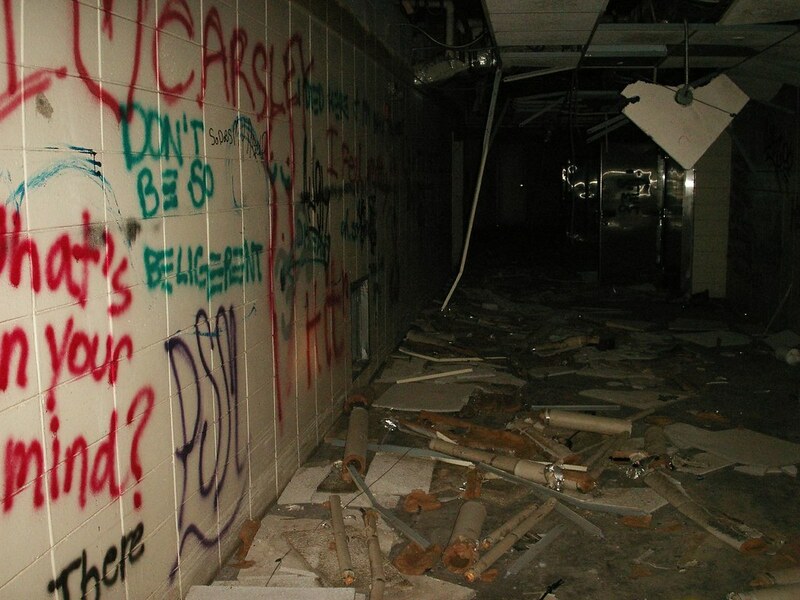 They are in violation of building codes as well as the newest sign ordinance and therefore are not allowed. I reminded the City Council that we have pending litigation regarding illegal billboards that were erected high over our heads, aimed at the travelers on 285. So if we approved the proposed bus shelter agreement for an estimated $30,000 per year for advertising pointed directly at our residents; that we would be hypocrites selling our city short. Signing a ten year year deal would have locked us into this revenue source for that time and allowed the sign company to place signs like shown above. Then about ten years from now, a completely different city council with no history of the subject might reapprove the item to keep the status quo and to lock in the funding source for an extended time. The contract item presented in June was deferred pending the same legal research that I have been waiting for since April of 2012 and though I am a patient man the content and the specific target of the sign based on its location outside our biggest city park and only middle school has forced me to bring this item to a wider public light. I want this visual pollution gone and I want to follow the lead of other cities like Roswell who actually offer amenities to the residents where they are needed with no advertising attached. I prefer charm over cash as once you lose the one, you would have a hard time buying it back even if you had plenty of the other. Thoughts? The Sidewalk Improvement Program was created to provide an objective process to prioritize the City’s sidewalk projects. The City has identified over 21 miles of future sidewalk improvements and 87 future ADA-compliant sidewalk ramps. Since 2009, the City has invested nearly $1,000,000 on completing roughly 5.4 miles of new sidewalk infrastructure, making Dunwoody a safer, healthier, and more enjoyable community for all. Sidewalk Improvement Policy details the purpose, goals and requirements of the sidewalk improvement program. This policy also includes the criteria used to prioritize sidewalk projects. Existing and Future Sidewalk Map shows where the city’s potential sidewalk projects will fit with the existing sidewalk throughout the city. Prioritized Sidewalk Improvement Plan (updated August 2013) scores potential sidewalk projects based on the specific criteria listed in the Sidewalk Improvement Policy. The City of Dunwoody will be hosting a Public Information Open House to collect input and feedback and discuss the installation of several new sidewalks located on the following roads: Peachford Road, Hensley Drive, and Mount Vernon Way. To best collect all participants’ insight into the projects and identify specific challenges or concerns with the sidewalk installations, the event format will be an open house style overview instead of a formal presentation. This format allows City staff to individually address project questions and collect input which will assist in fine tuning potential approaches and solutions to construction and installation. If you have further questions or wish to suggest additional sidewalk segments not already planned, please contact the Public Works Department at 678-382-6850. 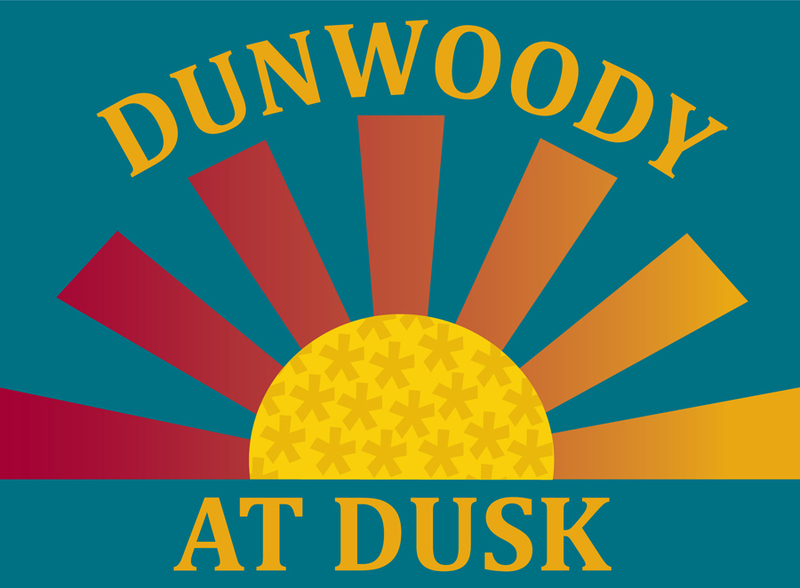 Dunwoody Food Truck Thursdays at Brook Run - extended through October 24th but hours are now 5 pm to about 8 pm. 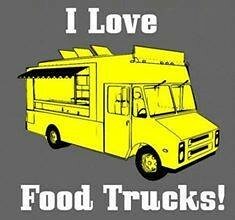 The Inaugural season of the Dunwoody Homeowners Association sponsored Dunwoody Food Truck Thursdays @ Brook Run Park started the last day of school in May and is now extended through October 24th. Savory & Sweet Food Trucks every Thursday night in Dunwoody at Brook Run Park. Free live music every week. 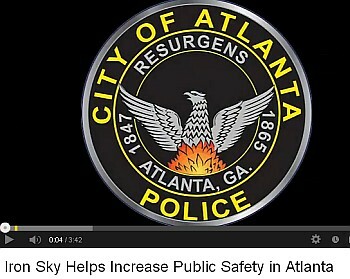 This event is a partnership between DHA + Redbird Events + City of Dunwoody. 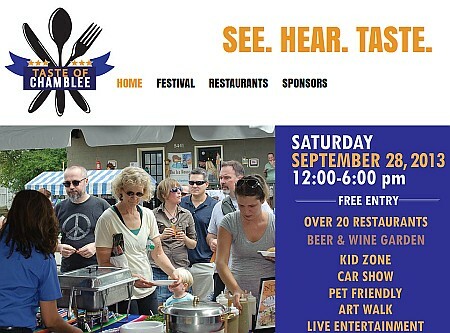 The Dunwoody community supported the event from day one and we had good crowds all summer long and only had rain during the event twice in 15 weeks! Now the weather is cooling off and it is getting dark earlier. Lines have been shorter since school started back. Beginning this Thursday we are adjusting the hours to 5:00 pm - 8:00 ish for the rest of the season till our last night on Thursday, October 24. We encourage you to come out and support the event so we can continue next year. We have a great night of fun for you this week. Music by Time Pilot and drinks by Moondog Growlers! Come out early and enjoy the sunset! Ps: This Thursday will be the second time attending for the award winning Tex’s Tacos food truck. We were rained out their first time in Dunwoody. Help us give them a Dunwoody welcome this week! 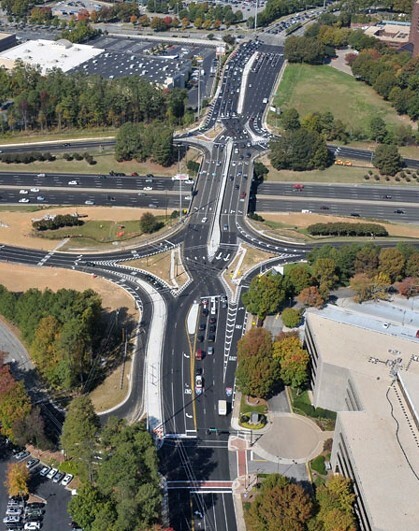 Award Winning I-285 and Ashford Dunwoody Diverging Diamond Interchange. 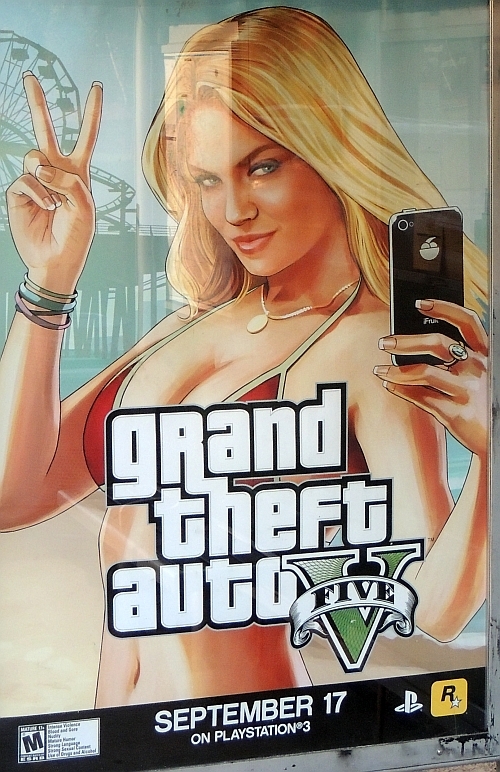 Is it also the People's Choice? 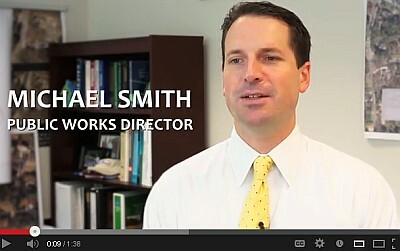 Georgia Department of Transportation saved 55,000 daily motorists’ commute time and greatly improved safety with its $6 million I-285/Ashford Dunwoody Interchange project, which was completed one month ahead of schedule.A 2010 study showed the interchange had a high collision and fatality rate compared to similar interchanges in the state. GDOT decided to construct a diverging diamond interchange to combat the problem, making it the first DDI in the state. The design relieves congestion for those who commute to one of the region’s largest employment centers while improving safety elements to reduce fatalities and collisions. With a well-developed awareness program, members of the community were informed through web updates, news stories, and a life-size simulation interchange for the public to test prior to the construction’s completion. 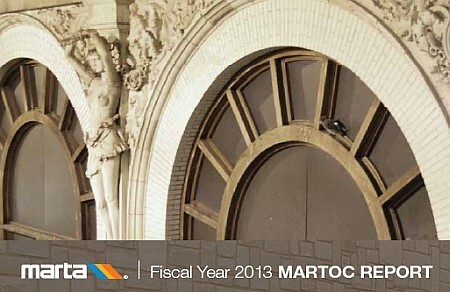 The project was completed in June 2012, a full month ahead of schedule. Interim Superintendent, Michael Thurmond to speak at Dunwoody High School on Wednesday, 9 a.m. The DCPC meets monthly on the first Wednesday of the month (unless otherwise noted), starting with refreshments at 8:45 am. The meeting starts at 9:15 am. 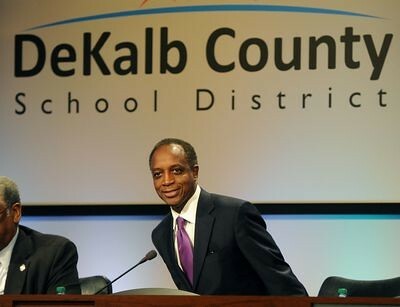 and ends by 10:30 A.M.
DeKalb School Supt Michael Thurmond address DeKalb Delegation on March 18, 2013. Sen. Fran Millar asked about Cluster Charters. Interim Superintendent Michael Thurmond shares his vision for revitalizing the school district and restoring full accreditation. 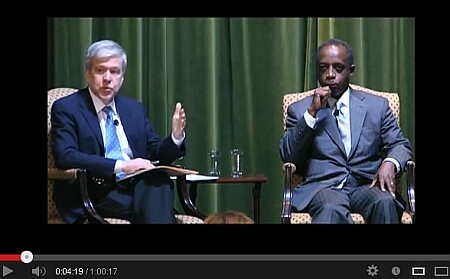 Discusses Dan Weber plan about Charter Clusters at the 17 min mark. Elaine Boyer has long been the lone Republican voice on the DeKalb County Commission. For 20 plus years, Elaine has represented the more than 120,000 residents in District 1 encompassing much of North DeKalb - including Brookhaven, Dunwoody, Tucker, Smoke Rise and Northlake. 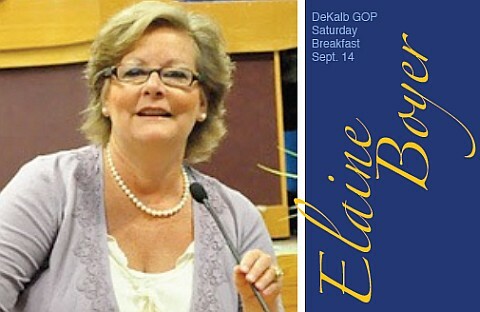 While politics in the county may change, Elaine has remained a strong voice for conservatism fighting to limit the tax burden, reduce the size of government, constituent advocacy, and the safety of the families of DeKalb. Wrightʼs Gourmet is located behind the Hickory House at 5482 Chamblee-Dunwoody Road in the heart of Dunwoody. $10 at the door includes a great breakfast. 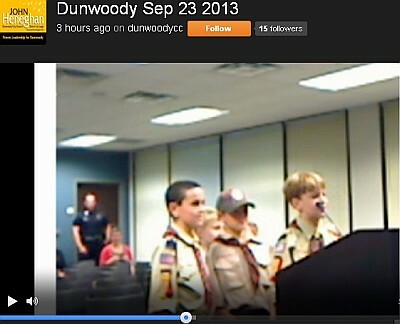 Dunwoody City Council Meeting for Monday September 9th. Discussion of Request from DHA for Continuation of City Co-Sponsorship for Food Truck Thursdays. Discussion of Contract Award for the Roof Replacement at the North DeKalb Cultural Arts Center. Discussion of Recommendation of Audit Committee to Appoint the Internal Auditor. Discussion of Council Consent of Audit Committee Appointments Nominations. Discussion of Agreement with ConnectSouth for Georgia. Discussion of Atlanta Regional Commission Grant for Chamblee Dunwoody Road. Discussion of Purchase of the Final Tract ("C") of the 19 Acre Property. Discussion of 2013 Neighborhood Paving Contract. Public Works has completed the paving originally planned for this year. In anticipation of potential surplus funds available for paving, a second bid was advertised in August to allow for additional paving before winter. The second bid consists of patching and repaving of the above streets. 1. Streets that have water lines that need to be replaced by DeKalb County were excluded from this bid. 2. Streets adjacent to arterial and collector roads scheduled for paving in 2014 and 2015 were excluded from this bid. 3. Streets that are candidates for full depth reclamation were excluded from this bid. The above is still subject to changes as the City Council discusses this proposal on Monday and votes later in month. Dunwoody Mayor and City Manager have presented the proposed 2014 budget to the City Council for consideration.